After defeating Wayne in a bracket play-in contest, the Boone Central/Newman Grove Cardinals finished the annual Mid-State Conference Tournament with a three-game run in Norfolk this past week. 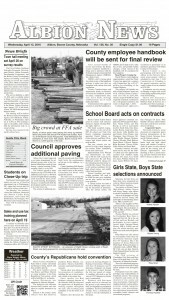 Boone Central/Newman Grove needed a top effort against #1 tournament seed Crofton (15-3) Monday, Jan. 28. The Cardinals got the effort, but couldn’t find enough points to stay with the C2 #3 Warriors in a 44-25 decision. BCNG could muster just two points in the opening period and and fell in a 21-8 hole by intermission. 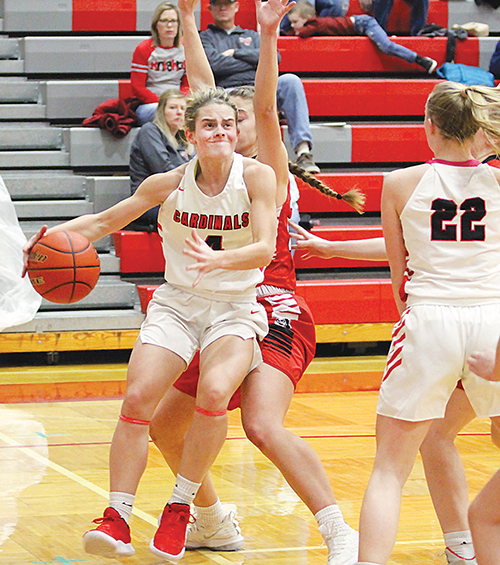 “Overall, it was disappointing to lose, because the girls were right where they needed to be defensively – holding a powerful offensive team to 44 points,” said Cardinal Coach Andy Imus. “Offensively, we struggled shooting the ball. We shot 7-of-28 on 2-point fields and 1-of-17 on 3-point field goals, for an effective field goal percentage of 19 percent. Another strong effort by the Cards was rewarded Thursday, as Boone Central/Newman Grove road a second-half rally to a big 47-36 win over Hartington Cedar Catholic in a consolation bracket contest. The Trojans got nine points by Jada Cattau in the first quarter, then hit a trio of 3-point shots in the second to take a 29-22 lead into halftime. The second half was all Cardinals, however. BCNG clamped down defensively and outscored Cedar Catholic 25-7, as Hedlund scored 19 of her game-high 28 points, including one 3-pointer and 8-of-10 free throws. “It was a tale of two halves. We just did not do a good enough job defensively in the first half. We had girls out of position, and a lack of focus gave them some layups off back cuts,” Imus said. “We started to switch their ball screens in the second half, and did a better job of pressuring their guards and making them uncomfortable with the ball. Boone Central/Newman Grove finished its exhausting week with a 33-25 loss to Norfolk Catholic in a game for 5th place Saturday. Cardinal shooting woes returned, as BCNG shot just 25 percent from the field, including a chilly 1-of-10 from 3-point range. After leading 10-6 at the end of the first quarter, the Cardinals were outscored 12-0 in the second and could add just 15 points in the second half. “Norfolk Catholic did a good job sagging in its help and taking the driving lanes away – especially taking away what Lauren wanted to do,” Imus noted. “She creates quite a bit with her driving and does such a good job knowing when to take it (shot) or pass it off. We just couldn’t get a flow offensively after the first quarter.